The Comfort Revolution Ultraluxe Standard Gel Memory Foam Pillow features premium memory foam. This helps to provide ultimate pressure relief and support for back, side and stomach sleepers. Intuitive 3D gel comfort provides a refreshing cool-to-the-touch sensation. The dimensional design aids in relaxing and reliving tension precisely where needed. A breathable cover allows circulation of airflow. 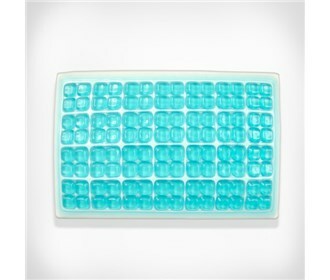 Gel provides a soothing cooling sensation to promote a comfortable sleep environment. The included pillow cover is removable and machine washable for easy care. Dimensions: 24" x 16" x 5.75"
The Ultraluxe Standard Size Gel Memory Foam Pillow F01-00458-ST0 has many exciting features for users of all types. See the Ultraluxe Standard Size Gel Memory Foam Pillow F01-00458-ST0 gallery images above for more product views. The Ultraluxe Standard Size Gel Memory Foam Pillow F01-00458-ST0 is sold as a Brand New Unopened Item.